Acres of wheat fields covering the farming landscape along Highway 5 in Southern Alberta, Canada. As you drive along Highway 5 between the two towns of Cardston and Spring Coulee in Southern Alberta, Canada a majority of the landscape is made up of perfectly kept farming land. This particular field is two shades of hues as these farmlands have been prepped and tended to so that a major crop of wheat will be ready for harvesting one day. Trimmed and two tonned brown wheat fields along Highway 5 between Cardston and Spring Coulee, Southern Alberta, Alberta, Canada. 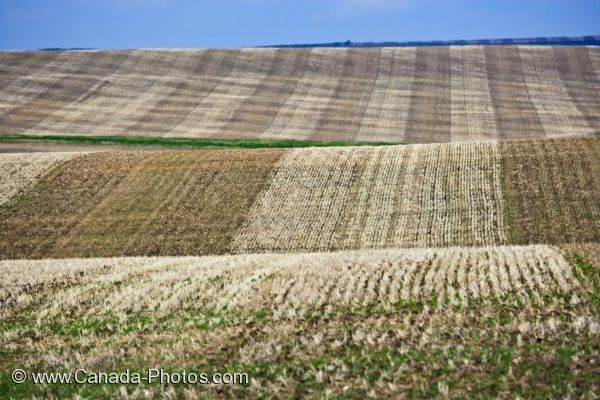 Picture of two toned wheat fields in the farming area between Cardston and Spring Coulee in Southern Alberta, Canada.